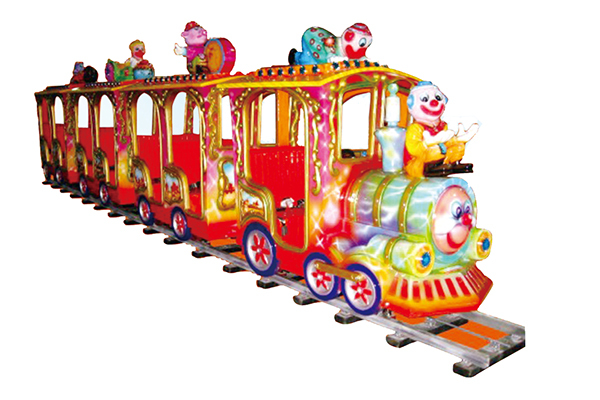 Amusement park electric train type forest hunting ride with laser gun for kids is composed of several rail cars which neither connects to each other in the head nor at the tail. All these rail cars move along a fixed track, with passengers operating laser pistol freely during its operation. Once being targeted, the animals shall take funny and interesting postures while making animal sounds of various kinds, giving people a feeling of returning to nature. The products are featured with the fact that both the car body and the rail pads are made of high-quality glass reinforced plastic, which are manufactured by adopting a technology of color separation. Therefore, the prod-ucts are rich in colors, attractive and durable, reliable in its structure, with the parallelism, shape and length determined based on the specific conditions. Besides, the quantity and category of the animals can also be determined by users.